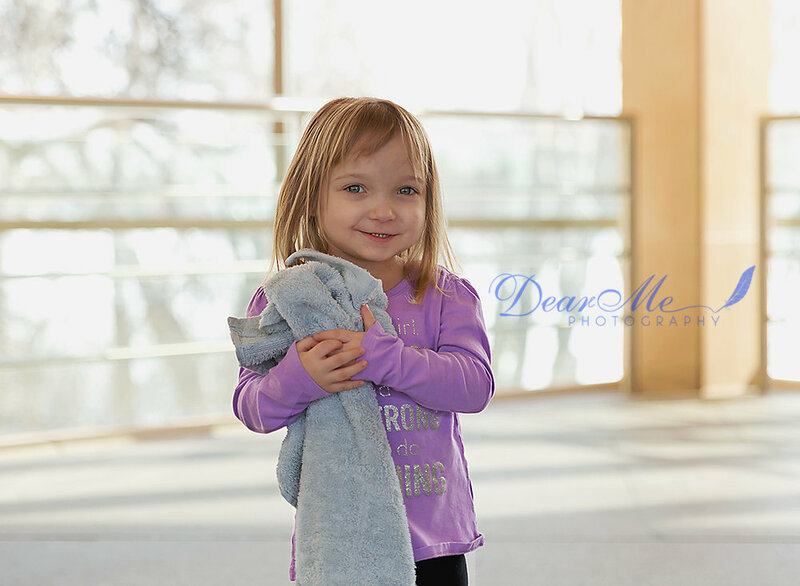 Meet Kylie, a sweet 4 year old girl that was diagnosed with autism at 2 years old. She arrived with her towel in hand as her comfort item and I didn’t want to take that away from her. She is a cute little girl who really liked to cheese it up for the camera. When Kylie was younger, she was having severe meltdowns without warning. She couldn't handle water in the bathtub during bath time. She did not like having her clothes off and she needed to wear her shoes all the time, even to bed. Kylie also was not talking. It was tough for her parents to hear her twin sister talk non-stop, yet Kylie was unable to. Kylie loves to snuggle. She is super silly, sweet, and so innocent. Kylie has an excellent memory and notices minor details very well. She is a great listener at preschool and tries her best. Kylie is always very proud of all her hard work and sometimes carries her paperwork around 24/7 for many days or even weeks. Kylie's biggest struggle is sensory processing. She can't handle most clothes and has problems with getting her hair brushed. She only accepts one brush and it has to be the same color and brand. Kylie also struggles with being rushed. Her parents have learned to have patience or she will shut down and it takes a while to get her to function again. Kylie loves being outside. She loves swings and anything moving. She loves rides on the 4 wheeler and her favorite thing is riding in the tractor with her dad while he feeds the cows. Kylie loves anything dark blue. Her favorite characters are Paw Patrol, especially Chase. Kylie also loves Cinderella and Elsa, most likely because they both wear blue dresses. The biggest lesson Kylie’s parents have learned raising a child with autism so far is patience. They have learned that if she is rushed, Kylie will shut down and it takes them much longer to get to where they need to. The advice Kylie’s parents would give to someone who wants to help and support a family and individual with autism is to read up about autism. There is so much behind an autistic person and they are not all are the same. If you suspect that your child may have autism, Kylie’s parents recommend to get your child tested and get into therapy as soon as possible. Kylie has been in therapy since she turned 1 1/2 and does up to 2 1/2 hours of therapy each week day. Her doctor calls her the "miracle case" because she has overcome so much in such a short time. She works incredibly hard during therapy and usually falls asleep after her sessions. Kylie is now talking a lot and even in sentences. She is learning how to handle every day things, like brushing her teeth and hair all the way to learning how to play with kids. Keep an eye on my Awareness Blog and Facebook every day this month to learn about more amazing kids with autism!